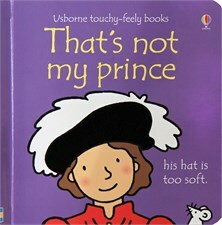 Little children will love meeting the dashing princes in this touchy-feely board book – but which is the right prince? Will it be the prince with the fluffy hair, the silky sash or something else entirely? With rhythmic text, bold illustrations and touchy-feely patches on every page, this colourful board book will prove irresistible to the very young. Ever so witty... the princes have hair that is too fluffy, sashes that are too silky and cloaks that are too velvety. If my daughter continues to insist on talking about handsome princes, I hope she does so in as irreverent way.